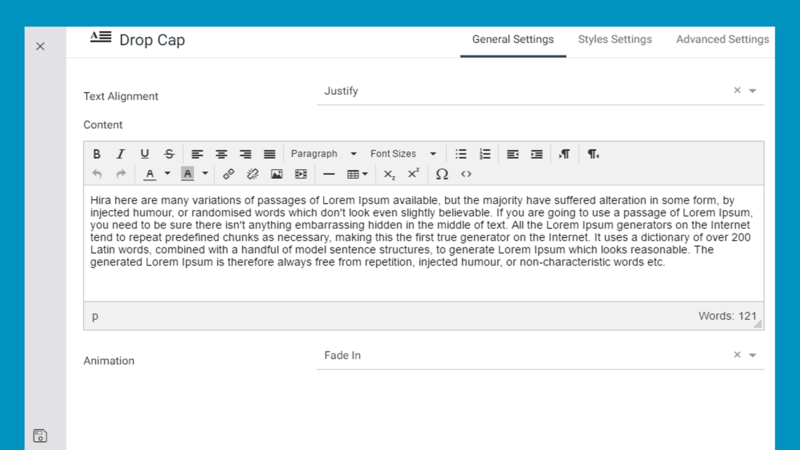 This module allows you to stylize a paragraph in your own way. If you want to highlight the first letter of the paragraph and further stylize a bit including changing color, font weight, background and much more, this is the what you need. Text Align : Define the position of the texts used in Drop Cap. You can put either left, center or right. Content : Write the content text here. Animation : Select the animation style from the drop-down that how you want the Drop Cap section will appear. Drop Cap Font : Customize the Drop Cap Font. You can choose from plenty of existing Google fonts and define its type ( Bold, Italic, and Underline, Uppercase, Lowercase, and Capitalize as well ), size, line height, and letter spacing. Drop Cap Color : Define the color that you want to apply for the first letter of the Drop Cap. Drop Cap BG Color : Allows you to select a background color for the Drop Cap. Drop Cap Padding : You can define the amount of padding in pixel for Top, Right, Bottom and Left as well for the Drop Cap letter. Drop Cap Margin : You can define the amount of margin in pixel for Top, Right, Bottom and Left as well for the Drop Cap letter. Border Styling : You can enable or disable appearing border for Drop Cap. Border Radius : Define the amount of radius you want to apply on the border. Border Width as well as Border Radius options will appear only if you enable the Border Styling feature. Font : Select a font for the content texts of Drop Cap. Text Color : Choose a color of content texts. Background Image : You can use an image as the background of Drop Cap. Background Color : Either you can select a solid color to use as the background. Margin : You can define the amount of margin in pixel for Top, Right, Bottom and Left as well for the Drop Cap content section. 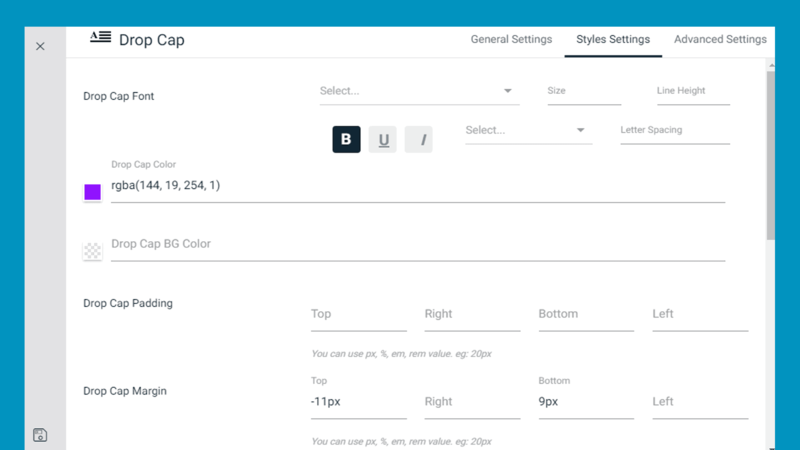 Padding : You can define the amount of padding in pixel for Top, Right, Bottom and Left as well for the Drop Cap content section.